The 2017 Fiat Punto became the first car to ever get zero stars in the European New Car Assessment Programme’s crash testing, the safety organization said Wednesday. That’s not a great score, and the necks of these crash-test dummies will probably be hurting in the morning. It’s immediately clear that things are going to go poorly when this video from the European NCAP opens with absolutely no stars illuminated for the five-door hatch, which Fiat advertises online as having the “utmost passive safety” and “all thrills and no spills.” The rating is so bad that despite getting zero stars from the NCAP, Google’s results page still shows it to have one. The European NCAP said the car performs well enough in physically protecting passengers and pedestrians for two stars, which is understandable since the car didn’t totally crumble upon impact. But its failures elsewhere disqualified it, in a way, from getting any of the stars it earned. The NCAP scores in four main categories: safety of the adult occupant, safety of the child occupant, pedestrian safety and safety assistance. The full results of how the Punto did in those categories can be found here. It is let down in driver assistance and crash avoidance: with only a seatbelt reminder system for the driver as standard, no points were scored in this part of the assessment. While the Puntos of the world have absolutely nothing to brag about after this one, safety ratings have come a long way over the years. 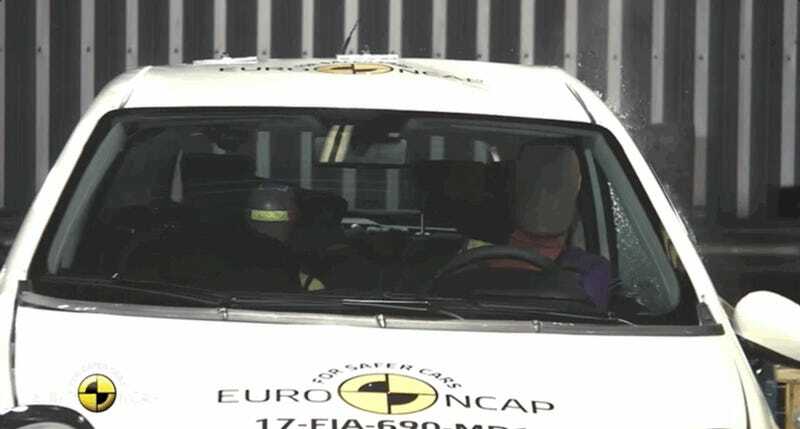 Perhaps one of the best examples comes from the European NCAP, which has been around for 20 years. 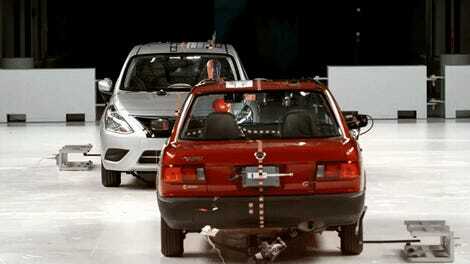 A side-by-side comparison of cars crash tested by the European NCAP went up on YouTube earlier this year, showing just what car safety looked like 20 years ago versus what it looks like in 2017. There are also countless other examples, like the ever-terrifying crash test between the 1959 Chevrolet Bel Air and 2009 Malibu, or the horribly recent test that slammed a U.S.-spec 2016 Nissan Versa into a 2015 Nissan Tsuru made for the Mexican market. The Tsuru is basically a new 1992 Sentra, and got a far uglier zero-star rating than this Punto did. So, while you’re better off getting a new, zero-star Fiat Punto than you are a 1997, one-star Rover 100 in the European market, maybe don’t get either of them. There are plenty of European crossovers that got five stars from the NCAP this year, which is far more stars than the Punto got. We know how much everybody loves crossovers, after all.